I hope everybody had a glorious Labor Day. We had a nice one here. Though I must admit I do feel nostalgic for the Labor Days of my youth when the holiday meant nobody labored. It used to be that you had to stock up on Saturday because come Sunday and Monday, everything was going to be closed. Driving around this year and it was hard to find anything that was closed, which kind of defeats the whole point of the holiday, but what are you going to do? Watching the Tennessee Department of Education and the states two largest school districts, Nashville and Memphis, wrangle over student data continues to resemble WWE’s Summer Smackdown – lots of posing coupled with little substance. Quick recap, in case you are new to the game, new legislation passed last spring that School Districts have to share directory data with charter schools and Memphis and Nashville don’t want to do it. Over the last couple weeks just everybody, including council members and state representatives, have wrapped themselves in the flag and strode to the podium to talk about the injustice being perpetrated by charter schools mis-using the data provided, despite evidence of a wide spread threat. The districts arguments are that sharing the data is a violation of a federal rule amended in 2011, and that the intent of the state statute was to exclude the data from being used for marketing purposes. The holes in those arguments are that their is dispute about whether the federal rule contradicts open records laws and that whatever the intent of the new legislation, explicit language excluding recruitment purposes was not put in place. In the center of this is the the Tennessee Achievement School District. They are like that prom queen fallen from grace. Once they were everybody’s darling and now they can’t buy a friend. In talking to people in Memphis, an important element in the fight is the fact that for years the ASD unwarrantedly bullied everybody else and now that they are weakened, turn around is fair play and this is one more way to quicken their exit towards the door. I’ve long said the ASD needs to go. ASD director Malika Anderson has always been forthright with me and I believe her heart is the right place, but let’s face it, founder and former ASD head Chris Barbic handed her a defective product when he left. In fact, if it was a used car, I think she’d have a case under the lemon laws. So, this part of the argument I’m good with it. It’s the posturing and hypocrisy with the rest of debate that loses me. It was reported last week that Board Chairwoman Anna Shepherd sent a letter to State Superintendent Candice McQueen pushing back on the state requirements. Let me rephrase that, at the conclusion of a meeting with Ms. McQueen, in which everybody had the chance to air and discuss grievances, MNPS presented a letter raising issues never raised in the meeting. You can read for yourself how that went over in Ms. McQueen’s response letter. In the immortal words of Keith Moon, like a lead ballon. In my eyes the whole argument boils down to opening another front in the battle against charter schools. Which would be fine, and welcomed, if somebody actually was able to describe what happens when the war is won. How are you going to ensure that all kids have access to a quality school once district is free of charter schools. That’s where I’d like to see the focus – eradicating demand instead of supply. I suspect the goal here is less about getting rid of all charter schools and more about making sure only the ones certain board members like survive. The privacy issue in my eyes is just a piece of a strategy to get to that place. A strategy not all that dissimilar to the one employed by President Trump to get rid of the Affordable Care Act, starve it and then decry its failures. I’m not down playing the seriousness of student privacy. Peter Greene has an excellent post and interactive map highlighting the seriousness. It’s a vital issue, which is why I hate to see it hijacked for political posturing. I asked people in the know how many outside companies does MNPS provide directory information. While I haven’t been able to get an official response yet, estimates run between 50 and 75 third party vendors. McQueen herself in her letter mentions companies selling class rings, yearbooks, and photographs. Those popular MNPS call out? Third party vender provided directory information. Charter schools are just a small portion of this issue. A larger conversation about student privacy would be a good thing. I think that an annual review of policy to ensure that everything is being done to protect student information should be a priority. But it needs be an honest conversation, not one cloaked in hidden agendas. In an NPR interview Shepard let the cat out of the bag about what’s driving this fight, “I think that we are at a saturation point. I know we are at a saturation point monetarily,” McQueen is kind enough in her letter to point out that under the new state law MNPS should recoup about a million dollars in costs associated with charter schools. Over the last several years MNPS, along with many other school districts, has been besieged by a shortage of substitute teachers. It’s a huge problem and one that has a direct impact on student learning. Recognizing that sub pay was long over due to be increased, MNPS did so at the end of last school year. Apparently that has had little effect because they have now gone to a favorite tool of theirs, an outside consulting agency. similar capacity to increase the district’s substitute teacher fill rates. By partnering with Education Solution Services and aligning their resources with the Metro Nashville Public Schools HR team, we hope to improve the substitute employee experience and increase the overall program success. The schools Education Solution Services will support are provided as an attachment. Education Solution Services will begin recruiting for these schools immediately. Any current or new substitute candidate, who plans to work in one of the selected schools should submit an application with Education Solution Services through their website at www.essgroup1.com. For current MNPS substitutes, new background checks will not be required. MNPS substitutes who wish to remain in the other locations not listed in the attachment, will not notice any change to the process. Substitute pay, including incentives, will remain the same for all substitute employees regardless of the school in which you choose to work. SmartFind will continue to be utilized as the Substitute Management System across all schools. For those substitute employees working in our other MNPS schools, you will continue your work with MNPS as usual. If you have questions about Education Solution Services and are interested in working in the select schools, please contact the Education Solution Services Onsite team at 615- 483-1326. If you have questions that are MNPS specific, please feel free to reach out to me at 615-259-8678 or via email at amber.tyus@mnps.org. I called ESS and talked to a very nice woman who was only too happy to give me what details she could, but admitted the list was a bit random. For whatever reason those were the schools selected by the district. Let’s see how this one works out. It should be noted though that we continue to pay large salaries to administrators and then outsource the work. The job at central office seems to have morphed into one of managing consulting companies and not district employees. If you are a parent, educator, or a community member in the Overton Cluster, there will be an informal Parent Advisory Committee meeting on Wednesday September 21 in the Tusculum ES library at 6:30. Under previous administrations the PAC was a vehicle for parents in the whole cluster to be informed about what was going on in schools. Last year PAC was not officially active but the Hillsboro cluster continued to meet. Maplewood also met a few times. This is an attempt to emulate those two clusters. All are welcome. Come share the positive news of your schools. Its neat seeing Whites Creek Students featured in this video from Ford Steam Day. 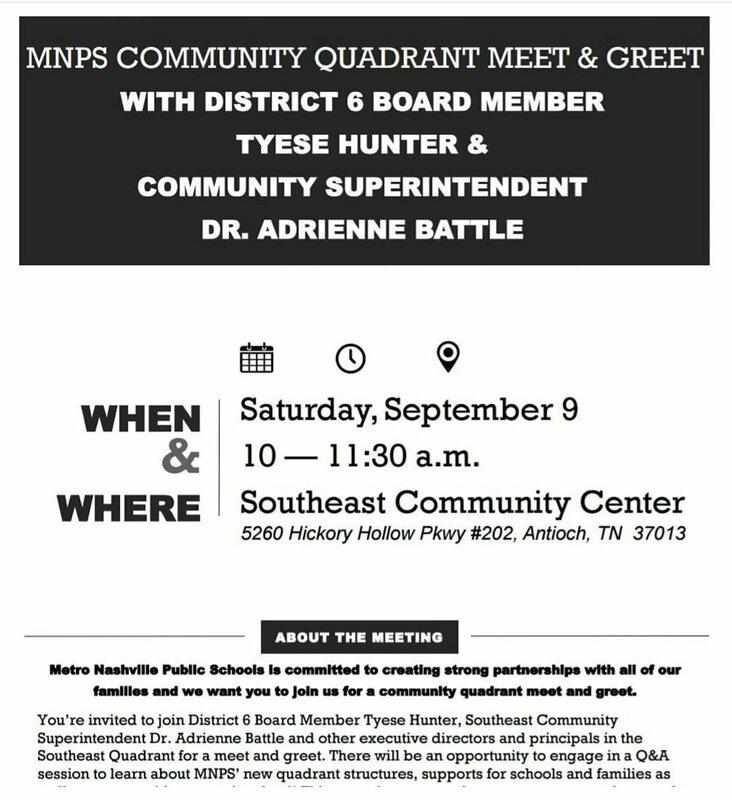 You are invited to a Southeast quadrant meet and greet with school board member Tyese Hunter and Community Superintendent Dr. Adrienne Battle on September 9 at Southeast Community Center. 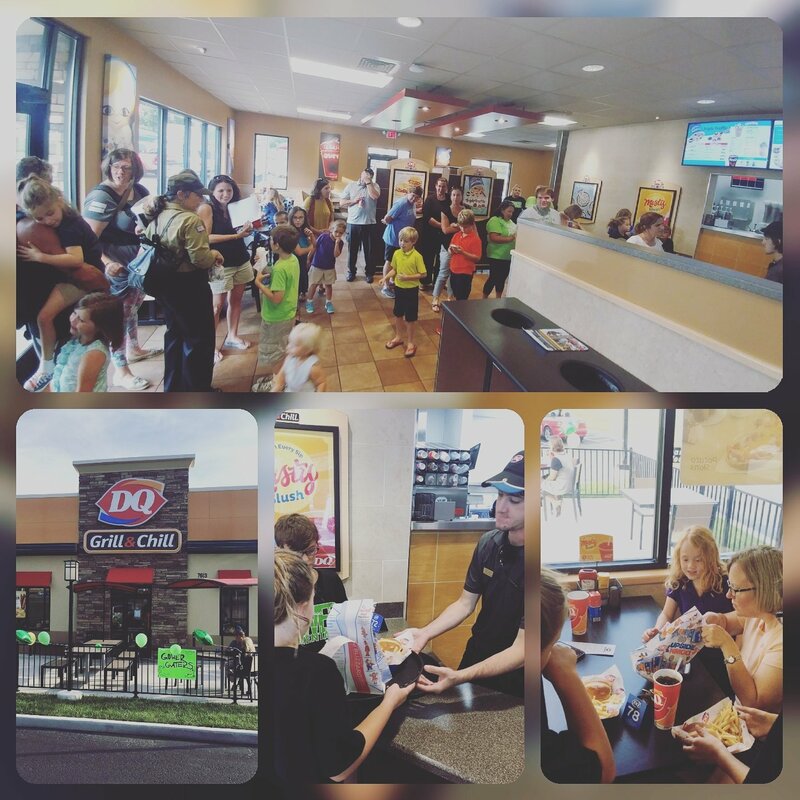 Gower ES PTO held a spirit night at the Dairy Queen on HW 70 last week. Looks like a great time was had by all. 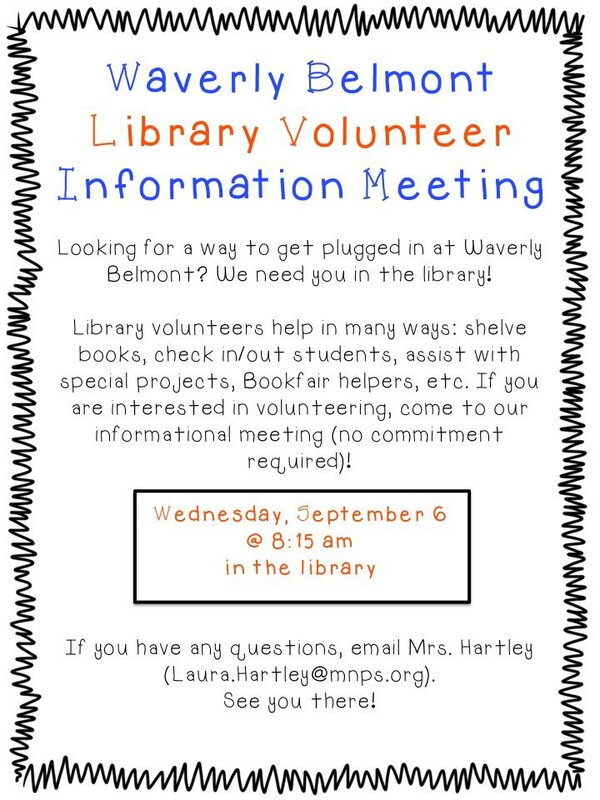 Waverly-Belmont is looking for some parents or community members to help out in the library. If that might be you, come to the meeting on September 9th to find out how you can engage. Once again we had good response to the poll questions and I am very appreciative. Thank you for your continued support. Let’s look at results. The first question asked for your thoughts on closing schools. The number one answer with 35% of the vote was that we should close charters first. The district should take heart in that the number 2 answer at 30% was “I wish we didn’t have to but…”. This shows that people recognize the need and if the district communicates it’s intentions clearly they should find some willing partners. Closing schools and rezoning is hard work and requires as many partners as possible. Here’s the write in votes. There are often ideas worthy of further exploration in these “other” responses. 5th graders belonged in elementary to begin with! Merge JB and Gra Mar! Why are we paying for execs’ doctorate degrees? id go with rezoning to balance numbers. look at out of zone students. Some legit some costing $$$ and issues! Community should be engaged every step of the way in something like this. The second question was in regards to the IFL units included in the new Advanced Literacy policy. If you are confused, and poll results indicate many of you are, don’t feel bad. This policy has been implanted as a shining example of building the plane while you fly it. I’ve never understood why people invoke that phrase with a sense of pride, but I digress. I’ve been turning that 3rd answer over in my head all weekend. What are the consequences if teachers do ignore the IFL units? What is the district going to do? They can’t afford to fire anyone because they don’t have enough teachers as it is. I tend to think that the ones who would ignore the policy would be the older more experienced teachers. When you consider that the majority of teachers in our priority schools are young teachers, how does this impact equity? Literacy coaches are evaluated on part, I would assume, on adherence to district policy. However, they don’t have any power to enforce adherence. I would think this puts them in kind of a precarious position and let’s not forget the district had to open up applications for that position twice last year in order to get enough applicants. Seem’s like we are running the risk of a negative impact here if we are not careful. Logic would tell me that when rolling out an initiative of this size you might want to spend some time informing and securing the support of veteran teachers before implementing. You might also want to develop clear instructions and a rubric for evaluating end of unit tasks. In other words, you might want to build the plane before it takes off. Here are the write-in answers and there are a lot. Stop buying junk/stop changing scope and sequence and content a last minute! I haven’t had enough planning time to even look at them. Couldn’t the units MNPS teachers wrote been used and saved us a ton of money? No experience with them. Yet. Feels like big brother micromanaging. Everyone becomes mediocre, art of ed lost. Again, you wonder if anybody is listening. That’s it for now. Please check out the Dad Gone Wild Facebook page, and if you’d like to give me feedback you can send me a line at norinrad10@yahoo.com. Next THANK GOD IT’S FRIDAY! Interested in your comments about all the teacher vacancies when teachers are getting displaced at a high rate this week. I know close to 10 and my circle is small. Have you heard of there are truly vacancies or is that not the case? 1. There are no additional pay raises associated with either route you choose. Substitute employees may choose to work solely with MNPS, ESS or both vendors; however, there is no additional compensation associated with this program. 2. The bonus structure that is currently in place will only work if you work every available day in the pay period with either MNPS OR Education Solution Services. We will not be able to share payroll records thereby allowing us to pay bonus to those employees who work for both entities as we originally thought. You must work with one company or the other during a complete pay period in order to qualify for the bonus. Please note the first day of the pay period that this goes into effect is tomorrow, Sept. 15th. 3. Education Solution Services is offering a flexible orientation schedule for those individuals who are interested in working with them. Please contact Marcy Everett, Director of Operations, at 615-483-1326 to discuss how they can accommodate you if you have not already.